This week the Supreme Court heard oral arguments involving an Indiana farmer who allegedly bought commodity seed from an elevator and used that seed to plant another crop. Monsanto argues this act would infringe on its technology use agreement. To me it sounds like Bowman did this knowingly violating the agreement. Personally, I don’t think he’s going to win this. Lower courts have already found in favor of Monsanto. I also have some agronomic reservations. Bowman has said the seed he bought was to be planted after wheat harvest. I’m also an Indiana farmer who plants soybeans behind wheat in the summer. I call this double cropping. The wheat is harvested in late June or early July, and if conditions seems right we’ll sow soybeans into the wheat stubble. Bowman says he bought the seed because it was cheap. I buy seed from a seed dealer just like my first crop, and purchase it at a hefty discount because it’s so late in the season. I’m not sure why purchasing bin run seeds for growing a crop is even a good idea for the following reasons. -Soybean varieties come in different maturity groups intended for different regions. The seed Bowman bought mostly likely would have been a mix of groups II, III, and possibly IV. Double cropping is risky here compared to a regular spring planting. Why would you plant something so late in the year not knowing what maturity group you are working with? Unless the elevator was somehow segregating seed by maturity groups, but that would be very odd. -Let’s say that bin run seed was actually kept for the following season. Why would I want to plant a field where the plants will mature at different times intermingled over an entire field? That is a harvest mess waiting to happen. I don’t know about you readers, but the whole idea of planting commodity soybean seed looks like a bad idea to me. And that’s before I’ve considered infringing on any patents. Update (2/24/13): I’ve been reading through the oral transcripts and looking around elsewhere. I don’t believe Bowman ever signed an agreement for the bin run seed. To me that potentially leaves a loophole for farmers to purchase bin run seed for planting without infringing on the patent. Bowman’s lawyer even argues the same logic as I have above that maturities as well as other qualities would be mixed, but he adds that this practice would only be viable for the riskier second planting. Doing this in the spring would almost certainly guarantee the farmer a poor crop in fall, so the lawyer argues this wouldn’t really hurt Monsanto sales of good, clean, uniform seed. I think that’s a pretty good point. What I don’t know is if Bowman saved any first or second crop seed for another crop. Bowman’s lawyer also seems to think a seed company should somehow bear some responsibility for the farmer’s crop performance. I don’t agree with that at all. This entry was posted in Biotechnology and tagged Biotech, Biotechnology, Bowman vs Monsanto, GMO, indiana, Soybean. Bookmark the permalink. combine to come around and cut it. Mike, the way I first saw your comment I thought this was the Monsanto argument until the last sentence. Then I scrolled up and saw this was Bowman’s argument. I may have to scour the whole transcript now. I guess I better first preface my comment or rather question with some background especially since this involves Monsanto. I am a rancher and with a reluctant heart sometimes do some farming as well. I am not a Monsanto or GMO hater by any means. Brian you bring up a HUGE point about maturity timing and making a crop with commodity seed, it just makes little sense at all that this is a good idea for Mr Bowman. Granted my only experience with soybeans is a test plot of forage varieties we did this year but I did clearly see the differences in maturity of the actual beans since we harvested them all on the same day. The case did bring up a question in my mind. I have never done it with soybeans but at times have purchased “commodity” or “elevator run” wheat, oats, triticale and barley to plant as a forage crop for haying or grazing. If, in the future some of these become patented would a farmer be liable for patent fees if there happened to be a small portion of GMO seeds in the mix and you were not propagating it for a “crop” but as pasture or hay? It is conceivable that you could purchase the seed and be totally unaware of there being any patented seed in the mix although I do not believe this was Mr Bowmans intent. Interesting times! Those are good questions and I don’t know that I’m the best person to answer them. I know as much about forage as you do grain, but I’d venture to say you’d fair better than I growing different maturities for forage. 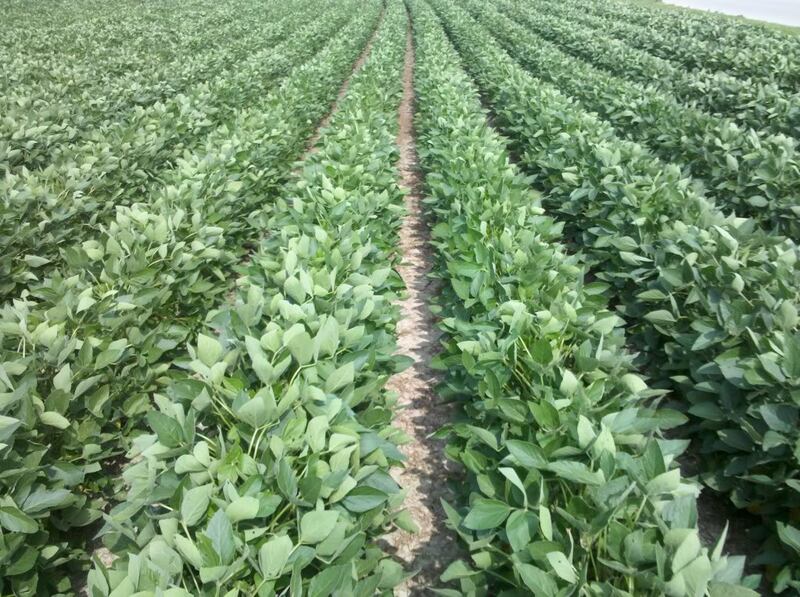 I’m thinking along the lines that you will have soybeans ready to cut mixed with green plants. And by the time the seed in the green plants matures the seed in the early maturities could be too dry and popping out on the ground. Yes, I can clearly see that a mixed lot of different group soybean maturities would not work well as a grain crop. I think the way you get into patented seed trouble is when you “use” the patented trait. For example, spraying the field with Roundup or Liberty and then saving the seeds for replanting the next year with the intention of spraying it with the same herbicide. As far as using bin run beans for forage,it wouldn’t be so bad, but you’re taking a risk., some beans would tolerate grazing better than others or if you’re cutting it for hay you’d want to cut at maximum food value. Brian, in Mike’s reply above where he quotes Bowman’s lawyer Mr Walters, I think Walters was trying to minimize the overt act of planting bin run seed, as you call it. In other words: So what if he planted this seed, it wasn’t going to benefit him much anyways. Interesting, Tom. It’ll be interesting to pick through it all. I’m guessing the justices will struggle with agronomy as well. I understand what Walters meant, but I could also see it as if you don’t know what’s in there maybe you should assume something patented is in there. I believe he signed a tech agreement for that seed though. Brian, I get the impression that farmer Bowman knew exactly what he was doing. Maybe I’m wrong about that, and Bowman was innocently trying to save money by using bin run seeds. This case does have a bit of a twist in that the third party of the elevator is involved. Brian, you’ve mentioned previously a similar comment about the elevator’s involvement in this. What is your concern? Do you think the elevator shares some liability, or did something wrong? I’d just like to know the details. Did the elevator know these were going to be used to plant another crop? Maybe that can be found in the transcripts. The Forbes article linked above also states that the elevator’s sales ticket to Bowman said “outbound grain”. -Page 57, this exchange occurred (Mr Walters being Bowman’s lawyer speaking arguing during rebuttal): “JUSTICE SCALIA: Do you agree that it’s unlawful for grain elevators to sell it for replanting? -Elevator had no clue Bowman was gonna use “outbound grain” as seed. Therefore, they broke no law. -Elevator knew what Bowman was gonna do with the purchased grain (nudge nudge, wink wink) but covered it up with a falsified sales ticket. -Elevator was busted by Monsanto or other, and have quietly settled the issue. That doesn’t answer the question as to what they may or may not have known. read the next to last page describing the letter that Monsanto had sent to him in 1999. Thank you, I am reading some of the arguments now. @Tom Mealer: Monsanto has won more than $23 Million from settlements in the lawsuits they have filed against farmers (that were settled last year). I challenge you that there are plenty of cases where they filed against farmers despite there being only inadvertent planting of the seeds, or even just pollination from neighboring farms that the defendants couldnt possibly avoid. Monsanto has time and again NOT CARED about whether it was inadvertent or not…they simply have wanted to force litigation upon the farmers just to send a message of intimidation. Check out the various lawsuits, and you will find that I am not far from the truth. Which farmers did they sue and why did the courts find in the Monsanto’s favor? I knwo the lawsuit that the farmers filed to prevent Monsanto from suing them for copyright infringement, and this was because they had seen Monsanto go after farmers even for inadvertent use of GMO seeds. The case was Organic Seed Growers & Trade Association, et al. v. Monsanto, I believe. As for why the courts found in Monsanto’s favor, the answer is quite obvious…the same reason they find in Monsanto’s favor in most cases…lots of political pressure. It is clear that our judicial system is not impartial…there is a reason even the Supreme Court is split down party lines. So when big money lobbyists get to the big name politicians, and those big name politicians put the pressure on, most cases go in favor of the corporate giant. Or they lost their case because this alleged intimidation isn’t actually happening. If there really are 250,000 thousand members and thousands of farmers (as you state below) behind this case why can’t anybody reference a single case of being sued by Monsanto for inadvertent patent infringement. Personally I think this David vs Goliath mythology is more about promoting organics and a chance at sliming Monsanto in the press than any real issue. Monsanto has the money to run anyone that puts up a fight into the round. Show me any average farmer that has the money to take a court case all the way to the supreme court? I personally know of people that have been intimidated by Monsanto goons coming to their door and demanding they turn over their records. There is also a case out there where Monsanto sued someone for enticing farmers to save GMO seed. This case stopped because the 75 year old couldn’t afford to, both financially and mentally, continue to fight for the rights of farmers. While some may believe David vs Goliath is about promoting organics I can tell you it’s not in every case Monsanto has filed. This was about a man making a living off practices that have been in use since long before we were here on this earth. Mr. Bowman’s case is in the Supreme Court right now. He seems like a pretty regular farmer to me. Yes for the most part but if you look into a little more his lawyer took this case Pro Bono and Monsanto made the mistake of filing suit against him right after he filed for bankruptcy. He has stated that he has nothing more to lose so he was going to go through with this as far as he could. So Mr. Bowman is not the regular farmer he appears to be. Most farmers have to worry about Monsanto taking away what they have worked years for and want to pass onto their family, Mr. Bowman is a bachelor and had nothing to lose going up against someone who normally just intimidates people into submission. TheAkyumenSociety, I have no doubt that Monsanto may have treated some people unfairly in enforcing their patents. But here, I was paraphrasing what the lawyers had argued before the court. I’m only here commenting about this specific case. Therefore, I’m not interested in taking up your challenge. That said, in this case, I think that farmer Bowman used Monsanto’s patented technology without permission – he used Roundup or a clone of it on the crop(s) planted from bin run seeds. Some say (see Forbes article linked above) that he did that fraudulently. I understand, Tom, but the fact remains that Monsanto cleverly keeps saying they dont consider accidental pollination a problem but still continue to sue farmers for copyright infringement when that does happen. My point is that if they are doing that, it is disingenous at best to state the opposite in this particular case. Thousands of farmers, over 250,000 members in fact, found it necessary to sue Monsanto to keep it from suing them for copyright infringement just because of cross pollination, etc. I believe the case was Organic Seed Growers & Trade Association, et al. v. Monsanto. I keep hearing about all these inadvertent contamination cases that people keep throwing around as evidence that Monsanto bullies farmers. Then I read the fine print and find out that the Percy Schmeisers of the world who claim to have been inadvertently contaminated are actually spraying glyphosate on their crops for the purpose of selecting and saving RoundUp Ready seed for future plantings, so they can use glyphosate in the future! A bunch of Big Organic activists actually sued Monsanto over this very issue and could not provide any examples of growers being sued by Monsanto for inadvertently planting their patented seeds. Unsurprisingly the case was dismissed. I’m not saying Monsanto doesn’t heavily handed sue farmers that use glyphosate on herbicide tolerant crops without paying the royalty fee. I’m saying they don’t sue for merely inadvertently having the patented seed in a field where a grower dosen’t use glyphosate or save the seed for a second crop. This is the claim you made above. I’d like an example of this claim. Your link does not provide one. One other thought here. We did do this exact thing once Brian. We planted sunflowers after wheat and wanted to save some money so just bought sunflowers that were being sold as bird feed. Unfortunately unbeknown to us the seeds went through a heat thus were sterile. Our choice to cut a corner was very risky, riskier than planting late after wheat as Bowman talks about. Luckily for us it was on a very small amount of acres, thus why we were willing to take the risk in the first place. Good point. If he was planting small acreage it may not be a huge loss. Small acreage is relative. planting 50 acres is small for some farmers. 50 acres is a lot if you farm 51 acres. Either way, spraying a herbicide just to see “IF” they might be herbicide tolerant would be really risky. After reading through the oral arguments one thing stands out to me. If Mr Bowman really wanted to he could have used conventional non GMO soybeans in his first crop and used some of this crop as seed. The fact that he admittedly used the technology but did so blatantly not wanting to have to pay for the technology and then sprayed the crop with Roundup hurts any chance I can see of him winning this case. It is not as easy as it is thought to readily find non-GMO soybean seeds anymore. Over 90% of the soybean grown uses GMO seeds, and most seed companies are breeding the GMO seed varieties. This is part of a very coordinated business maneuver by the GMO seed industry to completely phase out non-GMO seeds, which they are getting increasingly successful at doing…unfortunately. That may be the case now, but when he initially saved those seeds, Roundup Ready seeds were not the majority. Some sources of non-GMO soybean seed must be available because organic food processors are not allowed to use GMO soybeans. If I go to the grocery store and try to buy tofu (bean curd), the only brands available are organic and specifically say GMO-free. So someone is segregating non-GMO beans and selling them as a food stock. Farmers can certainly buy non GMO seeds. They simply have a choice in what products they choose to purchase. Mr. Bowman is, I believe, 75 years old. Which means he remembers the days when we used to save a gravity wagon full of the soybeans we harvested, pull them in the shed and store them to plant next season. Saving money is not a new concept for farmers because there have been more lean years than fat ones in my 40+ years of experience. Saving seed beans was standard practice and yes was long before GMO seeds were even a twinkle in someone’s eye. I am probably oversimplifying the situation. I just remember the simpler times when we were allowed to use our harvested crops as we saw fit, not how the seed company saw fit. Yes, Mr. Bowman is 75 years old. Yet, the incidents involved in this started when he was 59. I am sure he remembers when farmers would save a gravity flow trailer full of seed to plant the next years crop, since I can remember it as well. BUT, this is where it gets tricky. Logically, a farmer would want to make sure he was planting a short season bean if he was following wheat, wouldn’t he? Also, take into consideration that he bought these seeds in 1997, which would seem to indicate to me that it was from the 1996 crop. 1996. The year Roundup Ready beans were introduced. When about <5% of beans were Roundup Ready. So to save money, he planted some beans which he had no idea if they were going to mature in time to harvest. He went and sprayed them with a chemical which had ~95% chance of killing his entire crop..And he saved the seed from the plants he didn't kill. It seems that he had evidently not been doing this before. That this was the first time he went and bought 'bin run' beans and was so happy with the yield that he decided to save the seed. Nelson said what I was going to say, but better and more detailed. Good eyes on seeing that this started back in the mid 90s when RR didn’t dominate the soybean market. I’m not a farmer but I do know that soy is high in nitrogen. Harvesting wouldn’t necessarily be the reason for the planting. I’d use ‘junk’ seed to replenish the soil. Then it wouldn’t mater the maturation rate since it wouldn’t be cut. Tilling into the soil with whatever forms could be the answer. If there is not profit in the seeding mind you other than that replenishment… and with the great drought perhaps in prep for next year? Just some thoughts. I have no idea the mans intent but question is… did he harvest anything? Also if the seed was for sale… at a seed dealer. Was this practice also prohibited? If so how does one give proof of destruction? Is there a % for recovery and destruction as ‘damaged’ seed like they do for OTC Pharmaceuticals? It’s possible he could be using the soybeans as a cover crop, but I don’t believe that is the case this time. I’ve got a copy of my tech agreement in another post here. Also remember he was saving seed long before last year and the drought. This case goes back quite a few years now. Just a quick question: it’s the technology agreement that carries the requirement for refuge areas, right? So going around that means no legal basis for having to do that? Well refuge wouldn’t apply to soybeans, but it’s not likely anyone is going to come after you for not planting refuge. It’s hard to prove somebody didn’t do it because I don’t have to buy my refuge corn from the same place I buy my Bt. There needs to be consequences for bad actors, but farmers don’t want more regulation either. I think this is the real reason behind “refuge in a bag” products that are marketed as making refuge less confusing. It’s not confusing at all to me, but the RIB program ensures a farmer is planting refuge since the Bt even seed and refuge are mixed as one product instead of two. Hi Brian, it most certainly is an interesting issue, one that is even starting to have ripples here in Australia. I can tell you that growers here do get chased if they don’t have their refuge crops in. Anyway, that is beside the point, thank you very much for sharing this on your site. I keep meaning to read up on how the case is going & have found this post & everyone’s comments very interesting. (sorry, I am on the road and didn’t get back to this) Yeah, it doesn’t for soybeans–but for corn or cotton if you pulled them from another source there’s no way to require refuge, right? It doesn’t come from the patent or any other law, does it? If GMO patents are invalidated, it seems to me there could be a regulatory gap there. Not that I know of. Cotton is a bit different because I think it required a 50% refuge at one time. I don’t know if that’s still true. Corn was and still is 20%, unless you buy RIB which is now down to 5%. I suppose a requirement could be made that you buy enough refuge for a Bt purchase all from the same location. I don’t like that though. I actually probably have a lot more refuge than I need or am at least providing refuge for neighbors because our waxy corn isn’t always Bt and popcorn definitely is not. 1) Bowman clearly knew exactly what he was doing: unlike other cases, the presence of RR crops on his land was neither unintentional nor unexpected. He also “used” the technology by spraying his crop with RoundUp; again no one disputes this fact. 2) Contrary to some reports, he did not save seed from this crop for future use: he clearly felt that by purchasing seed from the elevator, he could avoid the legal issues of saving his own seed, and that’s exactly why he bought the seed from the elevator in the first place. 3) No one is arguing that Monsanto’s patent on the seed and the TUAs that prevent re-planting of the harvested crop are invalid. Bowman willingly complied with these restrictions for his main crop. 4) Given the agronomic considerations pointed out by Brian and others above, the chances of this practice taking off and threatening the future of investment in crop breeding is extremely remote. Both sides seems to be arguing this case primarily on principle, in my opinion. The principle at issue here is whether or not Monsanto’s patent rights on the seeds can extend beyond the farm and into the stream of commerce. Existing patent law says “no” but it’s never been tested against articles which are easily duplicated (like seeds and software – hence the computer industry’s interest). Now technically, if Monsanto was able to exercise these claims, they could go after any one who bought seed anywhere that tested positive for their traits (and given the level of contamination in the seed supply, that means practically no one growing corn or beans is safe). Realistically, it could/should be limited to those who make use of the trait, so let’s hope that SCOTUS recognizes this. Given the level of agronomic knowledge they’ve displayed so far, however….! Actually it has been tested in the software world. Microsoft was adding AT&T software to its a version of windows and selling as part of their package without properly reimbursing AT&T. It went to court, I believe SCOTUS and AT&T won their case. Also, to add to my comment. Using patent protected products and making them are two different things. According to what I read in the SCOTUS hearing that using RR soybeans (feed, fuel, food, etc) is not a patent violation by making them would be (planting and harvesting). It will be interesting to hear how this shakes out– keep us posted! Brian, reading your update I think you may be confused as to how patents work. Patents protect companies from others making and reproducing their licensed product. The contract in which you speak of is actually a licensing agreement with growers that defines how they are allowed to use the technology. In the case of Roundup Ready farmers are allowed to reproduce the first generation of seed and for seed companies they have a licensing agreement that allows them to breed and reproduce the technology and sell it to third parties (farmers) that agree to sign a licensing agreement that outlines what they are allowed to use the technology for. What I am trying to say is that the licensing agreement is not to restrict farmers on what they can and can’t do, but instead it gives them the right to use the technology, therefore anyone knowingly using the technology without a licensing agreement in place is at fault. I think I understand how they work, but I think Bowman might have a slight chance if the commodity seeds were sold without a tech agreement. If the elevator knew his intent, I think that’s a violation on one or both their parts. But seeing as Bowman is familiar with tech agreements having signed them for his first crop I would say he ought to have known he was at least pushing the envelope. And it’s still bad agronomy in my mind. I wouldn’t try it myself since I can get clean, uniform seed for double crop beans anyway. From Pioneer or Monsanto in fact. Do you usually use Roundup Ready bean seed for your double cropped soybeans? Yes, but since we are following wheat there’s a chance they might not even need sprayed. I think the agronomic reservation commentary of this article misses the mark. It doesn’t matter what the farmer uses the seed for. Its the fact that Monsanto claims them as its property. I think its a damn shame when farmers don’t band together and fight the immense power grab happening in the food system. Monsanto is way more aggressive in other countries and is quite literally destroying farming communities through predatory business practices (i.e. vast swathes of India, with some states seeing 100,000’s of suicides linked to Monsanto and the like). Also, Justice Thomas is a former Monsanto lawyer and should recuse, but he won’t because he is incredibly corrupt and doesn’t care. It is a direct violation of federal judicial laws. Only problem is Supreme Court is the highest court so there is no penalty to him for breaking the law. Wouldnt be surprised if his wife gets a fat 6 figure check like she did when the Supremes heard the Obamacare case. Shamelessly corrupt. Monsanto has used its political power (=$) to usurp tremendous power over our food system. Irregardless what happens, it is a travesty of the political and judicial system. Farmers everywhere would do themselves and the world a tremendous favor by simply studying what is happening and the flimsy patent claims these companies get away with.